There are three wood privacy fence designs that rank among the top. These include the lattice-top, shadowbox and your basic privacy fence. 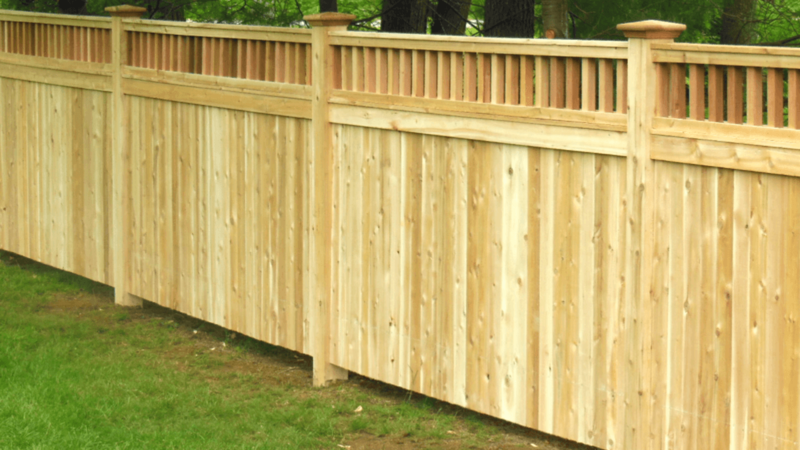 Cedar, cypress and pressure treated pine are the most common types of wood used to construct these fences which usually range from 6 to 8 feet tall. You will sometimes see these privacy fence designs used for fences that are less than 6 feet tall, but they aren’t really considered privacy fences. Any fence less than 6 feet tall is usually there for decoration or to keep in a pet and are not recommended for privacy. Of the three types of wood I mentioned above, treated pine is the most popular material for building wood privacy fences. This is because it cost less than other types of wood and will last a long time when it’s exposed to the outdoor weather. A lot of people choose to go with cedar when building their fence because of the red color and how it holds up to the weather. What most people don’t realize is that after a couple years, you can’t hardly tell the difference between a pine fence and a cedar fence. They both turn to a grayish color and last around the same amount of time. The main difference between the two is the price of cedar is much higher. Cypress probably last the longest out of the three, but it can sometimes be hard to find, and it costs more than pine. The most common style of privacy fence is the basic, treated pine, privacy fence which is made by simply butting pickets together so that it’s difficult to see between them. This is the style that you see used in most neighborhoods to give homeowners privacy in their backyards. A lot of people have the misconception that once they get one of these fences built that nobody will be able to see through the fence. This is not the case most of the time. Pressure treated wood has a tendency to shrink as it dries out. This means that even if your fence is built with all the boards touching tight together, gaps will eventually form between the pickets in almost all cases. The second most common privacy fence design is the shadowbox. This fence starts out like a basic privacy fence that has approximately 2″ wide gaps between each picket rather than them being butted together. In addition to having pickets on the outside of the fence, there’s also pickets on the inside of the fence that are spaced approximately 2″ apart as well. The gap between the pickets on the inside of the fence are lined up with the center of the pickets on the outside of the fence so that you can’t see straight through the fence. There’s boards (usually 2″x4″ in size) that run between the pickets on the outside and the inside of the fence. This causes the fence to have a shadow effect. The lattice-top privacy fence is the third most popular style of wood privacy fencing. This design starts out as a basic privacy with the addition of lattice added to the top. The lattice gets framed in with additional lumber for support. Most people agree that the lattice top is the best looking of the three styles. The only drawback is the price. The material cost is higher, and there’s a considerable amount of additional labor involved. If you would like more information about privacy fence designs or any other type of fence, visit our website at www.Best-Fences.com. You will also be able to view photos of the various styles of fencing available which will help you make a better decision when determining which fence is right for you.